This unit is a one row adjustable bed width with four 18" smooth disc blades with greasable nylon bearings. It also has an adjustable scarifier shank. The rigid frame disc is available in 4', 5' or 6'. These low profile discs have greasable nylon bearings and 16” notched disc blades. Ideal for 18 H.P. to 40 H.P. tractors. 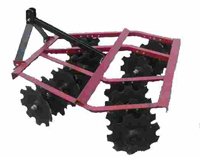 This towable disc is designed to be used with an ATV or by a small tractor. Each disc has 16" notched disc blades and greasable nylon bearings. The swivel hitch makes transporting an ease. The 300 series adjustable disc offers a more sophisticated look. The welded center frame and tubing style gang arms with a center bolt screw adjustment gives you a disc to fits any type of farming. 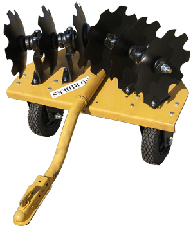 Available in 5 ½' and 6 ½' with ball bearings and 18" notched disc blades. The 500 series disc is designed for rugged and dependable use. 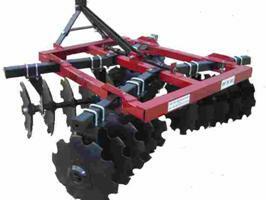 The welded center frame and tubing style gang arms with a center bolt screw adjustment gives you a disc that fits any type of farming. They are offered with ball bearings and 20" notched disc blades. 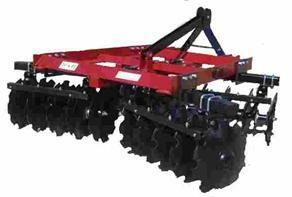 The disc are available with 7 ½" spacing for 7' disc or 9" spacing for 8' disc. This heavy duty disc is designed for 55 H.P. to 75 H.P. tractors. The main frame is constructed out of 5"x5"x½" tubing. 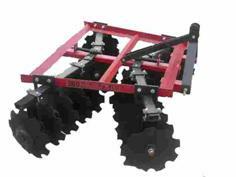 The 1500 series disc has ball bearings, scrapers, 22" notched disc blades and 1 1/8" disc axles. Weighs 1825 lbs.